The San Carlos tribe is fighting to block a massive mining project that would cut a two-mile wide crater through sacred land. The tribal drums began beating outside the Capitol at noon. 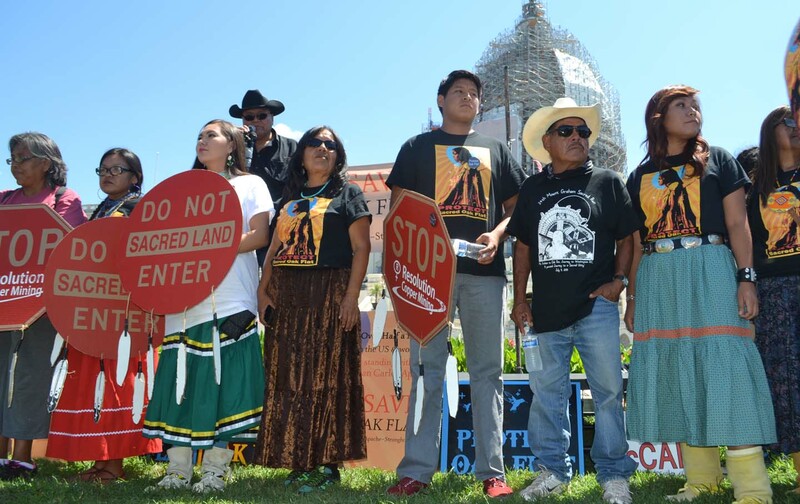 Dozens of activists from the San Carlos Apache tribe were gathered on the West Lawn, flanked by hundreds of supporters, with a clear message for Congress: Our sacred land is not for sale. Last December, the Senate passed the $585 billion National Defense Authorization Act. Tucked deep inside the 697-page bill, which covered everything from military pay to training programs for Iraqi security forces, was a land exchange provision handing over 2,400 acres of Arizona’s Tonto National Forest to Resolution Copper. The land exchange rider, introduced at the last minute, went largely unnoticed—but not by the San Carlos Apache. For nearly a decade, they had successfully fought to protect a stretch of the park known as Oak Flat from Resolution Copper, a joint venture between foreign mining giants Rio Tinto and BHP Billiton. The Apache and other local tribes consider the land holy and have used it for generations to hold religious ceremonies, from acorn gathering to coming of age rituals. The mine’s congressional supporters argue the project will inject desperately needed jobs and money into an economically depressed community. But tribal leaders like Chairman Terry Rambler question the number of jobs the mine would bring. And the San Carlos Apache have allies in Congress as well. Last month, Rep. Raúl Grijalva of Arizona, co-chair of the Progressive Caucus, introduced bi-partisan legislation to repeal the land exchange, calling it a “sweetheart deal”. Apache-Stronghold also has the backing of a growing number of tribal associations, including the National Congress of American Indians, which voted to support the effort to repeal the land exchange earlier this year. And over 1,000,000 people have signed an Avaaz petition calling on Congress to save Oak Flat. The growing support for the tribe’s fight, propelled into the national spotlight by a New York Times op-ed this spring, was on display at this week’s Save Oak Flat rally. On stage with Native American activists were speakers from the Sierra Club, the Center for Biological Diversity, the Progressive National Baptist Convention, and a steady stream of House members. At the rally, Noel Altaha sat under the shade of an umbrella, wearing a skyblue Apache T-necklace emblazoned with her name and an eagle, symbolizing her tribal clan affiliation. She joined the Apache-Stronghold’s caravan in New York, where members of the Tribe held a flash mob in Times Square last week. Nick KimbrellTwitterNick Kimbrell is a senior campaigner at Avaaz.org.